In Arthur O. Friel's jungle wilds, everything is out to get you. And he should know as he was a true life explorer and adventurer. Much like H. Rider Haggard and Talbot Mundy, Friel knew what he was writing about as he "lived the adventure" tracking through the forests of the Amazon and Orinoco. This gives his writing a sense of groundedness that is hard to top outside of the likes of Mundy's African tribes, Haggard's Ivory Trails and William Hope Hodgson's sea tales. Hodgson rode the seas throughout his teen years, giving him a wealth of background to work into his frightening tales. Arthur Friel, relentlessly curious, funded his own mission to find the white Indians of Venezuela. Along the way, he dealt with the severe tropical heat and humidity, diseases like yellow fever and beri-beri, and assorted vicious and deadly creatures packed so densely that they just about trip over each other--giant anacondas, jaguars, leaping spiders, fire ants, snakes of every description, and poisonous centipedes. Then, also, there were the Mayorunas, cannibals and headhunters who occasionally poison the streams because of "real or imaginary enemies." Friel found the white Indians, but they were not what he expected. 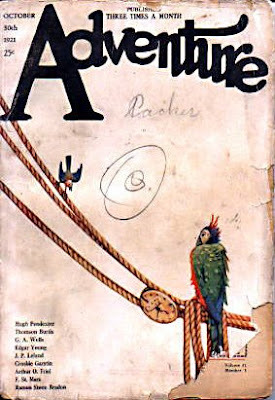 He made it home and became one of the most popular writers for Adventure magazine during the 1920s and 1930s. Of course he has inbued much pulpy goodness to his fictional adventures, pitting stalwart explorer heroes against jungle and river vampires, demons and sorcerers. Most of which appeared in the pulp magazine simply known as "Adventure". Our experiment today is the first in a series of adventures featuring the soldiers of fortune trio Roderick McKay, Tim Ryan and Meredith Knowlton. They are on the hunt for a missing millionaire "lost" in the Amazonian jungles of South America. Along the way they meet up with Arthur Friel's popular and long running characters Pedro and Lourenco, along with headhunting Mayorunas and the even more frightening Red Bones tribe. Use megaupload to download the 26 chapter .rar file. Bill Hollweg in his podcast OTR Swagcast brought to my attention a show I'd come across many times but had never really paid attention to. I LOVE A MYSTERY written and produced by Carlton E. Morse. 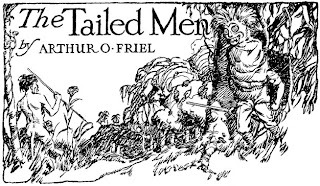 In particular the serial Bill's highlighting, TEMPLE OF VAMPIRES, is very similar to Friel's Amazonian stories. ILAM is a series featuring three soldiers of fortune turned detectives who globe trot around the world looking for adventure. 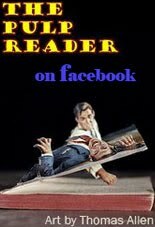 TEMPLE OF VAMPIRES along with other ILAM serials and even other Carlton E. Morse series such as Adventures By Morse many times feature South American adventures such as LAND OF THE LIVING DEAD and STAIRWAY TO THE SUN . ILAM can be found at Archive.org. Most of the series is missing and only a few complete serials are believed to exist. For TEMPLE OF VAMPIRES I'd wait and listen to the restored episodes Bill is pushing out every Thursday. Along with ILAM, other Morse series can be found as well such as the sequel to ILAM, I LOVE ADVENTURE which is the further adventures of the same characters, but with the stories told in total in a single episode form. It is also at Archive.org.